Every so often I feel I want to brighten up my watch wardrobe, especially if I’m out for dinner and maybe even dressed for the occasion. Something that maybe we don’t do often enough these days and certainly something I don’t do enough, being retired. Years of going to the day job, dressed up, tends to make one “dress down” when in retirement and maybe even to forget the odd shave – very remiss. What to wear? Well this will do nicely ‘cos it’ll go with anything . . . . But with age comes a certain freedom, where that silly old soul can wear an outrageous bow tie with a blazer or have an overly elaborate walking cane (never had one before, but what the heck!). Maybe you can make some amazing, amusing or cutting comment that could well be in the category of – “You can’t say that!” – that’s awful . . . . ! And get away with it. And so it is with the choice of watch on your wrist, which neatly brings me to this model – the Swatch “Rounds & Squares” SUON122. 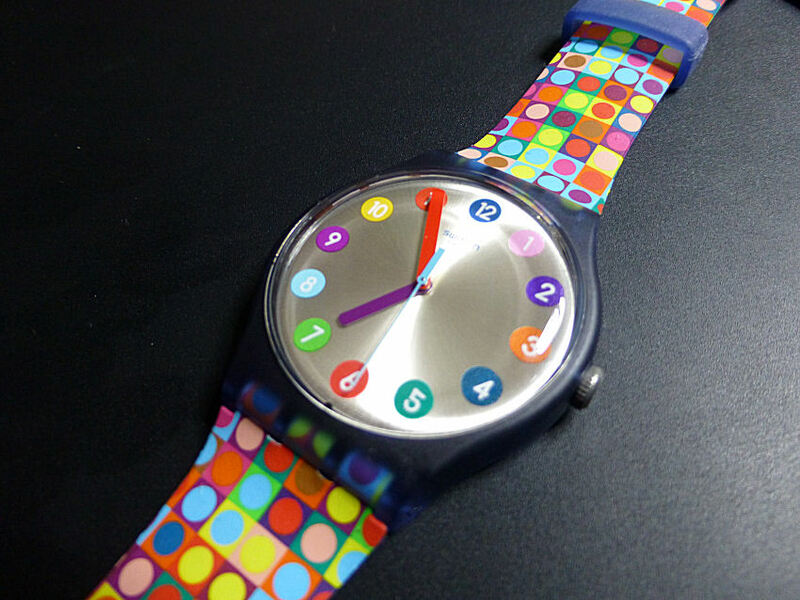 Swatch “Rounds & Squares” model – for geeks. An ultra modernist Quartz in silicon, plastic, with an abstract style with a blue case and multi-colour strap and an every colour dial. The ultra lightweight case will manage a 3bar Water Resistance, so should withstand the odd glass of bubbly thrown at it, or even if the wearer might accidentally (or was he pushed?) fall in the pool. Now OK the watch survivability might be around 50%, which oddly enough is probablyabout the same (or better) as the old wearer . . . It has a center seconds hand and a neat little screw (coin) hatch at the back to access the battery and the strap as seen here is just fab’ and amazingly flexible. Did I just use the F word? Goodness, is that sad or what . . . . I mean I was old when they started using that! Coin battery entry hatch – easy fit even for me! Anyway as watches go it’s a pretty decent size at 41 mm diameter and commendably just under 10 mm thick, AND it’s plastic, but without the over size silly “ooh is that a watch then?” look, a style that frankly has lost it’s charm for me – but this is different AND it looks good! Yes this Swiss offering actually looks great – it’s bright, it’s colourful and OK, perhaps a little OTT (did I mention the second hand is “pastel blue?) but despite all that unbelievably I can think of lots of old guy eccentric clothing to go with it. I’ll look some out later . . . . So being in a sort of dark mood the other day, I went and bought it, sad I know, but that’s what happens when faced with a hypnotic strap such as this. How could you do it, I hear you ask? Swatch that goes with – everything! Well it was like this. I spotted it when having lunch with a friend – a friend who is an Ex geek. I know the ex idea seems bizarre but there he was, wearing believe it or not one of those ghastly Hawaii style Miami Vice era multi-colour, but long sleeved, shirts (the rest of his attire was no less incongruous – long shorts and hiking boots – and this is March in Scotland!). Anyway it happened as my companion asked him the time and as a result I sort of did a double take, as my ex geek pal pulled up his shirt cuff and looked at this continuation of his – “shirt”? 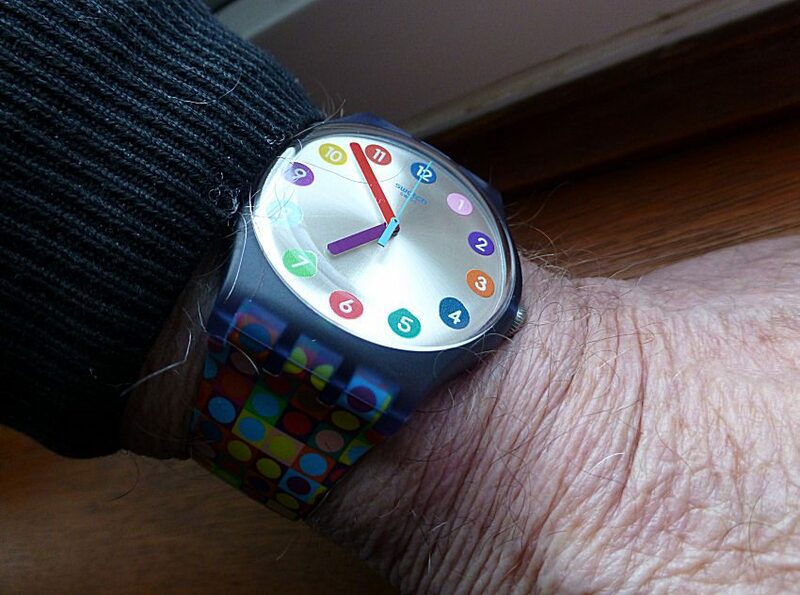 But NO – he was actually looking at his nice new Swatch watch, which was virtually indistinguishable from his riotously bright outfit, in almost every way! And as I say – I was hooked . . . . . It was a lousy day, wet, dark and utterly miserable and there he was – a riot of colour, watch and all! Well when I got home I looked it up, loved the colour, price OK and ordered one on the spot – and would you believe it – I was already starting to feel much brighter myself. 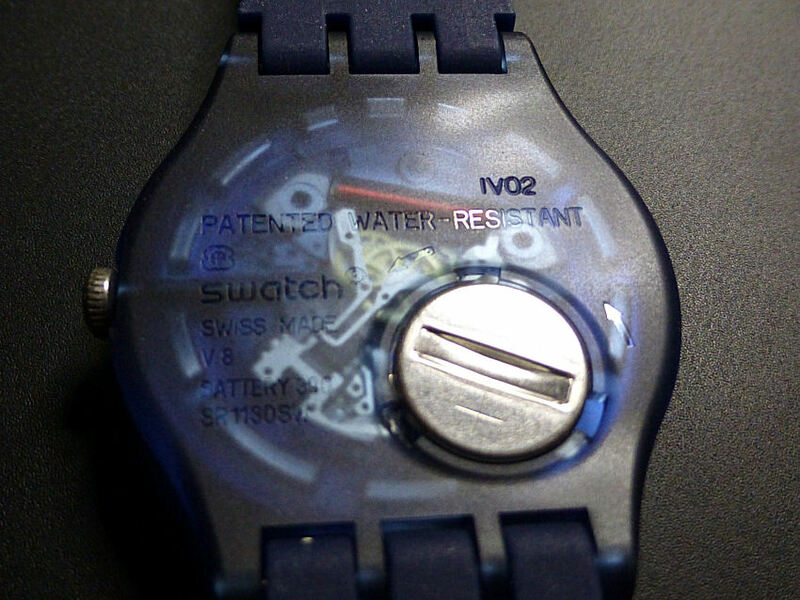 It came directly from Swatch in tick tock land, so took a couple of days. Now perhaps it’s a cheap (relatively) and definitely cheerful watch of course, but it’s also absolutely a bit of fun to wear and it will do me nicely, oh yes, it’ll do me just fine. 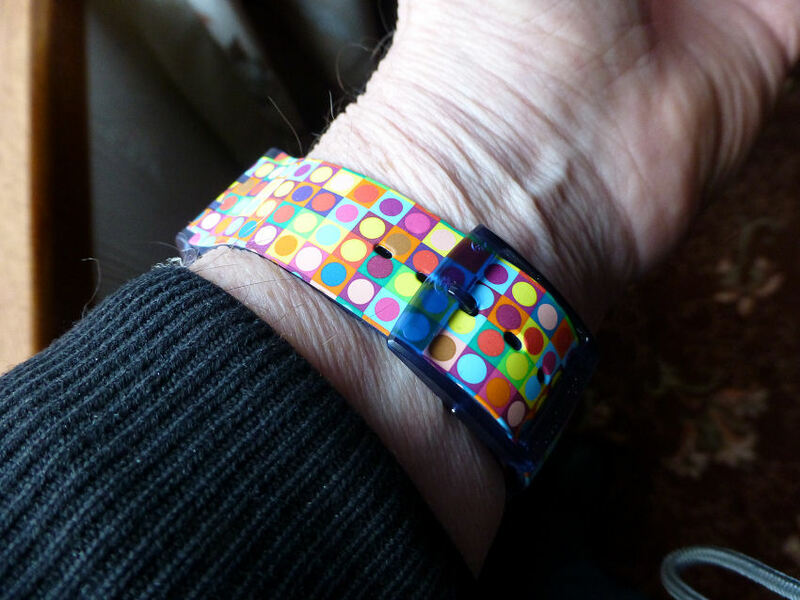 This entry was posted in Fashion & Designer, Spotlight, Watch reviews and tagged Swatch colours, Swatch Rounds and Squares. Bookmark the permalink.